Mushrooms in garden - New no-dig with fungi erupting. Will they poison us? Our 20inch deep no-dig veggie garden consist of from the bottom: cardboard, hay, bone/blood meal, straw, bone/blood meal topped with 4 inches of planter's mix (top soil and compost). Our well-begun seedlings have been planted and now large groups of toadstools or mushrooms are bursting up, I believe from the straw. What to do? Some have been dug and removed, but others were chopped into the soil. Is there any worry of poison from the mushrooms/toadstools affecting our spinach? Comments for Mushrooms in garden - New no-dig with fungi erupting. Will they poison us? Mushrooms are so nice! I think they are fascinating, and it's impossible to get poisoned by touching any of them, and you have to eat a decent amount of the poisonous ones anyway to suffer. Your veggie plants can't be poisoned by mushrooms or any sort of fungi either. So no worries there. These funny things are very efficient at spreading their spores, and what you see on top of the garden is nothing compared to the thread-like mycelium that is under the soil. Some mushrooms use up already decayed matter and others help break down leaves and such-like in the soil. Mushrooms are fungus and they grow in wet and warm conditions. They thrive more in the shade. 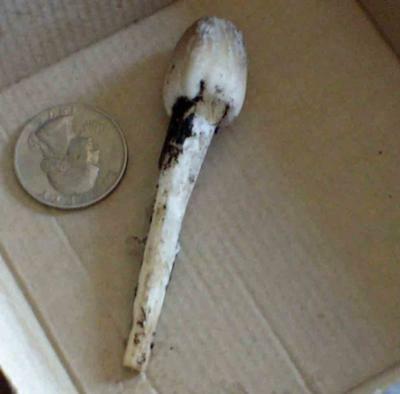 Your mushrooms have probably blown in as spores, or blew in on the straw before you bought it. Mushroom compost bought commercially doesn't usually have spent mushroom spores in it as they sterilise before selling it. So if your mushrooms are causing a nuisance and getting in the way of your seeds or plants, you can pull them out, or just leave them to die, as their life span is short. You can try a natural fungicide, such as 1 tablespoon of either apple cider vinegar OR 3% hydrogen peroxide in a gallon of water, if you feel the mushrooms are taking over your space too much. But really all you would be doing is destroying the surface mushrooms and spores as it takes a lot of fumigating to kill off the mycelium underneath. Just in case, it's important to wash your hands after touching some mushrooms, and to stop children and dogs eating them. There are an unknown number of species ? at least over 30,000 in US alone. At a guess, you may have a mushroom called Lepiota cepaestipes. I really appreciate your taking the time to leave such an informative answer! I have always been fascinated by mushrooms, but very concerned about poisoning ourselves and others! Groups of a dozen of these fungi are attached at the base in the straw layer and burst through en masse. I think our recent cool weather may have discouraged more eruptions and next spring we'll be adding layers, so hopefully they'll be too deep to reemerge. When i looked up Lepiota cepaestipes, I found this cool info. Thanks again and I welcome any other suggestions. My garden is loaded with mulch. I expect there will be toadstools bursting all over it all summer. My raised beds also are producing new toadstools every day. I keep picking them off, but there are new ones every day, many, many of them. It's from the dead sticks and mulch from the trees being cut down and mulched, and I put them in my garden and raised beds. I do hope they will not prevent the vegetables from growing or contaminate them. Thanks for the info..i was worried about poisoning my family since huge puffball shaped mushrooms are growing in my spinach bed.
. Funny thing is they only started when the weather got very cool, and we have had several frosts. But it has been extremely damp and there is obviously a lot of good organic material in the bed. I will just keep pulling them as they get big so they stop crowding out my greens! They MIGHT be magic mushrooms because they are quite common, but see if you can identify them from pictures on the net. If they are magic mushrooms, they wont cause a problem (unless you want to cook them up and dance around the room... or something) I didn't write that promise!